With the variety of things that wreak havoc on our digestive systems these days, it may seem impossible to try to get back in balance and restore yourself to optimal health. But it’s not just about digestive issues alone, as gastrointestinal health can be the root cause for many other health issues including brain and mental health. However, with a bit of planning and time, it’s entirely possible to restore the full health of your gastrointestinal system, which can have major positive effects on your entire body, from mood, to memory, and more. Healing your gut allows the body to build a stronger immune system and produce the right kind of bacteria that tells your brain that it’s okay to feel good again. The health of your gastrointestinal system is extremely important to your overall well-being. Largely responsible for the critical functions of the body’s digestive and immune systems, beneficial bacteria in your digestive system have the capability of affecting your body’s vitamin and mineral absorbency, hormone regulation, digestion, vitamin production, immune response, and ability to eliminate toxins, not to mention your overall mental health. Fermented Vegetables are foods that have been through a process of lactofermentation in which natural bacteria feed on the sugar and starch in the food creating lactic acid. This process preserves the food, and creates beneficial enzymes, b-vitamins, Omega-3 fatty acids, and various strains of probiotics. *See below for a step by step guide on how to ferment your own veggies. 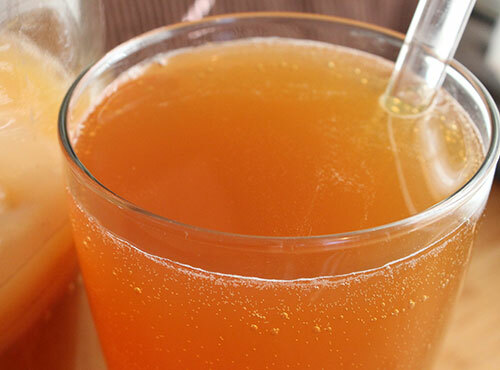 Drinking Kombucha aids digestion and improves gut health. Because it's naturally fermented with a living colony of bacteria and yeast, Kombucha is a probiotic beverage. This has a myriad of benefits such as improved digestion, fighting candida (harmful yeast) overgrowth, mental clarity, and mood stability. *See below for a step by step guide on how to make your own Kombucha. Kefir is a fantastic source of many nutrients. Kefir is a fermented drink, traditionally made using cow's milk or goat's milk. It is made by adding kefir “grains” to milk. ... Over a period of 24 hours or so, the microorganisms in the kefir grains multiply and ferment the sugars in the milk, turning it into kefir. You can use whatever you want as long as the cabbage is the main ingredient. 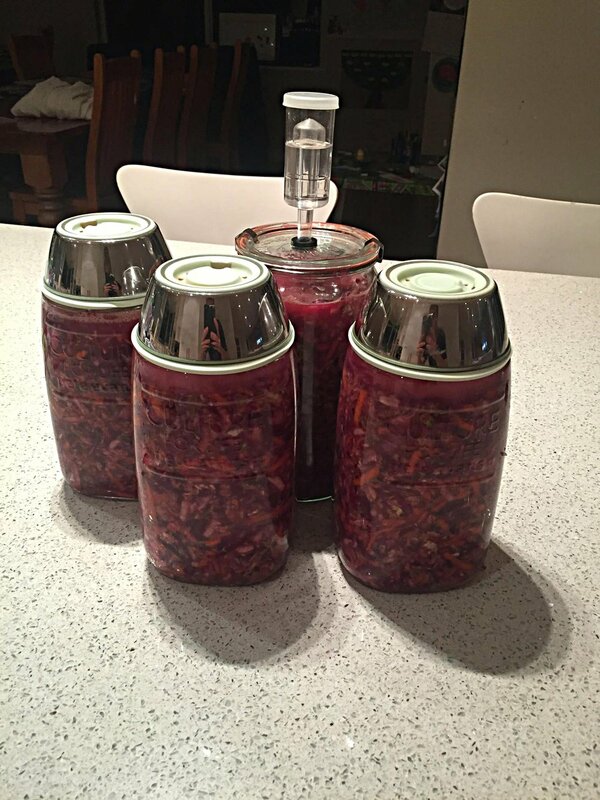 1- Sterilise your fermenting jars or clean and rinse very well. 1- Weigh all the veggies (in grams). 2- Slice up the cabbage or put it through a food processor, then place into a large bowl. 3- Add Celtic sea salt. Use 2.25% of the total weight (1.5kg = 1500g, 1500 x 0.025 = 37.5g of salt). 4- Massage the cabbage and salt for at least 10min. 5- Add the remaining ingredients and mix through. 6- Add mixture to the fermenting jars leaving a couple of inches free at the top. 7- Weigh down the veggies so they are submerged under the brine. 8- Ferment for 2-4 weeks (depending on how warm the room is). Note: Place your fermenting jar on a kitchen tray incase the liquid overflows while it ferments. Throughout the fermenting process make sure the brine is always above the veggies. -10 teaspoons of loose leaf tea. Note: It is not recommended to use flavoured teas or fruit teas. 1-Bring 1.5L of filtered water to the boil in a stainless-steel saucepan. Remove from the heat and add the loose-leaf tea and allow to steep for 8 minutes. 2-Add the sugar and stir until dissolved. Allow this mixture to cool to room temperature. 3-Pour this mixture along with 5L of filtered water into your Durand Kombucha jar. Note: If you don't have filtered water, just boil the entire 6.5L in step one. 4-Place your SCOBY in the jar and add the started liquid. 5-Cover the top of your jar with cheesecloth and secure it with a rubber band. Make sure the cloth does not have a weave that is open enough for fruit flies to get into your mixture. 6-Leave the jar undisturbed for 7 to 21 days in a warm, dark place that has some air flow. Seven days is usually ideal, however the brew time will vary depending on the temperature of your house and the size of your SCOBY. 7-Taste your Kombucha. If it's too sweet leave it to brew for a couple more days. If it's too bitter, reduce your brewing time for the next batch. 8-Bottle your Kombucha in flip top 1L glass jars and store it in the fridge. Note: Don't use a metal lid on the storage vessel. 9-At the end of the brew you will have two scobies. When your SCOBY is strong, healthy and big enough you can separate it into two, one for your next brew and you can give one to a friend who is interested in making their own. Use the top SCOPY for your next batch. If you require a SCOBY and starter liquid, contact us and we can either give you some or direct you where to get them. For up to date health, mindset and trading content check out our Facebook, Instagram and YouTube pages.